Grimming thermal spa in Bad Mitterndorf was opened in autumn 2009 and offers soothingly warm thermal pools with a water temperature of 33°C. The present admission prices are listed here. 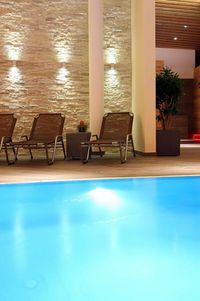 The thermal spa is open daily from 9:00 a.m. to 10:00 p.m.
More information is available directly at www.grimming-therme.com. Our hotels and guesthouses are partner business of GrimmingTherme.